The Puruncajas family, two generations of Ecuadorian climbers, is the team who leads Andes Trek Expeditions. 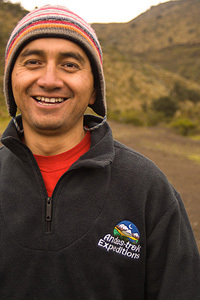 Our family is proud to partner with our neighbors: guides from a community of indigenous Andean Quichuas. Our guides are all trained in mountaineering skills, providing you with some of the safest and most knowledgeable mountaineering experts in Ecuador. Our team is excited to share with you our invaluable knowledge of the local environment and a history of local traditions and customs. We will ensure you experience the best of Ecuador; climbing majestic mountains and volcanoes, enjoying panoramic vistas overlooking crater lakes and finally relaxing with a satisfying hot meal after an adventure filled day. We will share the love of our home country and local expertise with you, showing you the best kept secrets and our favorite destinations. has been climbing since 1968, and created Andes Trek Expeditions in 1980. 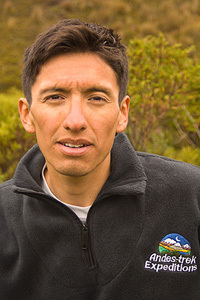 He is one of the original founders of ASEGUIM, the Ecuadorian Mountain Guide Association, and the former Vice President of the organization (2007-2009). He has summited all of Ecuador’s volcanoes and most of South America’s main peaks, including over 250 ascents of Chimborazo and Cotopaxi. He is an ASEGUIM certified guide and is fluent in English. He is excited to share his experiences and mountain adventures with you. Started climbing the snow capped volcanoes of Ecuador in 1985, and has climbed throughout all of the Ecuadorian Andes. In 1999, he moved to Germany where he spent five years climbing in the Alps and perfecting his German speaking skills. He has summited many popular high elevation peaks in Europe, such as Mont Blanc. He is a certified guide with the Ecuadorian Mountain Guide Association (ASEGUIM) and member of the German Alpine Club (DAV). fell in love with the mountains at a young age while climbing Ecuador’s volcanoes with his father. 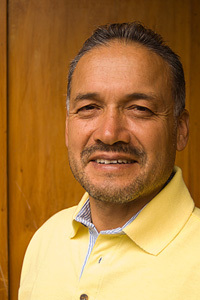 He has guided in the Andes for 8 years and has been guiding for the past four years in the Northwest United States. In 1997 he expanded his adventure skills by taking on rock climbing. He represented Chimborazo province three times as the Ecuadorian National Rock Climbing Champion. In 2002 he moved to the United States to study English at Eastern Kentucky University. While in the U.S. he has spent his free time exploring the vast alpine, mixed, ice and rock climbing areas, throughout North America. He completed his UIAGM Alpine & Rock certification with the Bolivian Mountain & Trekking Guide Association, accredited by the National School of Ski and Alpinism of Chamonix (ENSA), and has completed Ski Guides Courses and Exman with Argentinian Mountain Guide Association (AAGM).